An ultra-durable case that provides maximum protection for up to 44 liters of product, making it ideal for large sized medical equipment. With Pick N Pluck™ foam, customize it to almost any shape for 360° of equipment protection. This product is made to order. Call 866-469-6019 to request an estimated lead time. An ultra-durable case that provides maximum protection for up to 26 liters of product, making it ideal for medium sized medical equipment. With Pick N Pluck™ foam, customize it to almost any shape for 360° of equipment protection. An ultra-durable case that provides maximum protection for up to 73 liters of product, making it ideal for large sized medical equipment. With Pick N Pluck™ foam, customize it to almost any shape for 360° of equipment protection. 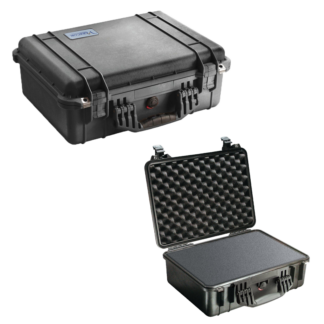 The 44L Medical Equipment Response Case (MC-MERC-044L) is a crushproof, dustproof and water tight case that provides maximum protection for contents, making it ideal for valuable medical equipment. The airtight, unbreakable, Pelican case, combined with a tamper seal lock and custom labeling, makes storing and transporting equipment quick and easy. Pack-up valuable equipment and be ready to respond. It features a retractable extension handle, polyurethane wheels, two carry handles, strong, lightweight, solid walls, Pick ‘N Pluck foam, easy-open, double-throw latches, complimentary alphanumeric identification labeling, and a lifetime guarantee. Three-piece foam set consists of one egg crate foam upper section, one Pick ‘N Pluck foam section and one blank bottom foam section. One retractable extension handle and two fold-down handles for easy portability. Watertight, crushproof and dustproof with an automatic pressure equalization valve to balance interior pressure but keep water out. Open cell core with a solid wall design that is strong and lightweight. Can credit cards be used for purchasing? Order thru GSA or Amazon websites, or directly from this website. For larger orders or for a formal quote please contact us (866-469-6019). What information is needed to order via credit card? Name on card, card #, expiration date, security code, billing address. Where can these be purchased? Direct from the website, and or on the GSA website. For larger orders or for a formal quote, please call (866) 469-6019. This product is made to order. This is a custom made product. Please allow 4 to 6 weeks for delivery. For more details, please call us (866) 469-6019.
and event info straight to your inbox. Call for support or if you have questions.